Soaking horse manure before feeding it to compost worms? Good day Stephan, I'm enjoying reading your book "How to start a profitable worm business on a shoestring budget." We have a ready supply of horse manure but I don't know how long to soak manure for? I can't seem to find a mention in your book other than adding water to a bag of fresh horse manure. One clip that I saw on youtube said you need to let animal manures sit for around 9 months before you can use them for worm composting. Is this true or will a couple of day's be suffice?. Hello Pete, I am glad you are enjoying my book and hope it will assist you to start and grow a profitable worm business. I am glad you raised the question about soaking horse manure before using it as worm food. Worm composting is not rocket science and there are really a lot of ways that will lead to success. There are many kinds of animal manures that can be recycled with the help of composting worms amongst them are horse-, dog-, sheep-, cattle- and rabbit manure. We have used both dog poop and horse manure fresh without any problems. The problem with horse manure is that it can be made available in different ways. The most unproblematic kind of horse manure are the pure droppings that are not contaminated with wee and wood chips or sawdust. make sure to only add a thin layer of about 10xm / 4 inches of horse droppings on the surface of the worm bin to avoid the manure to heat up. Should the horse droppings be contaminated with wee / pee they should be rinsed well to wash of the pee which could be harmful to the worms. This can be done by either soaking the manure in a drum with water and than draining the liquid off or by pouring water over the manure until the pungent smell of the horse pee is gone. Once that is achieved the manure can be fed to the worms in the same way as previously described. 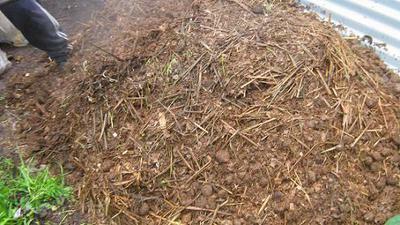 Another way to prepare horse manure for worm farms is to compost it on a windrow or a traditional compost pile. Copy and paste the URL above into your browser to have a look at that article. Lastly always make sure to only use horse manure for your compost worms from horses that haven't been treated with deworming medication before the manure was collected. Wait at least 3 days to collect manure from those horses if you intend to feed it to your worms fresh. I trust this information will help you Pete. If you have further questions please feel free to contact me.